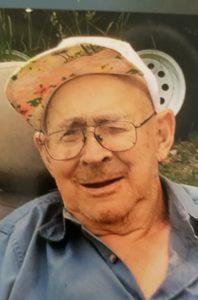 Wells, Vermont – Darrell “Pete” Moffit, age 91, passed away on Wednesday, January 15, 2019 at Rutland Regional Medical Center. Pete was born on February 22, 1927 in Dorset, the son of the late Edward and Hazel (Reid) Moffit. He met and married Charlotte “Hon” Howard in Dorset. They eventually moved to Wells where they established their home and raised their family. Pete was a logger in his younger years, then went to work at J. K. Adams until he eventually became disabled. As reflected in his job choices, Pete loved the outdoors. He was an avid hunter and fisherman. He enjoyed camping and gardening. If there was nothing else on his agenda, his favorite place to seat was outdoors. It needs to be noted that Darrell went by his nickname “Pete”, not only with his friend,s but his children also called him “Pete” not Dad. Charlotte was “Hon” always. So Pete and Hon will be fondly remembered by all. Pete was predeceased by his parents, six brothers Cyrus, Eugene, Edward and three as children and 3 sisters Mary, Mamie and Ruth, 2 sons Darrell and Walter and his beloved wife “Hon”. Left to cherish his memory are his children Mary Haskins (Doug) of Wells, Bruce (fiancé Irene) of Petersburg, NY, Philip (Jenny) of Stephentown, NY, Robert (companion Marie) of Bennington, Kevin of Wells and William (companion Linda) of S. Granville, NY. He was blessed with many grand children and his sister Alice Shattuck of North Carolina. A funeral service will be held on Sunday, January 20, 2019 at 3 PM at the Robert M King Funeral Home, 23 Church St., Granville, NY. Friends may call from 2 PM until the time of the service.